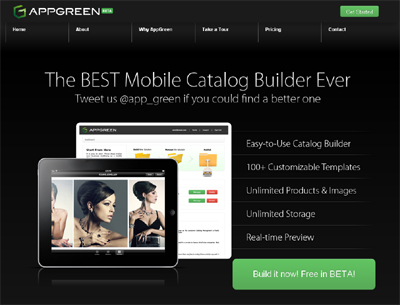 AppGreen is a free mobile catalog builder for everyone. It replaces your paper catalogs by helping you build your unique mobile catalog on iPad. It is the easiest catalog management ever. Data are stored in the cloud for your anywhere access. Provided with customizable templates to characterize your unique catalog. It’s time to forget about paper documents and PowerPoints. Grab them all into your mobile device and be prepared to amaze your customers. Show them your latest products at your fingertips and feel the efficiency that AppGreen brings to you. With our developing function in sales management, you could manage any sales activities of your team in our all-in-one user portal. The world changes every day, so does the business world. Are you looking for a new way of sales management? AppGreen helps you mobilize your business by providing cutting edge technology to build your own mobile product catalog and experience real-time sales management. You pay and you want the result. That’s why AppGreen provides flexible plans for your business based on your actual needs. No wastage of resources and your money. Upgrade your plan with AppGreen at any time later when your business grows bigger. We are all looking forward to this, aren’t we? Hey, do you know 32% of employees globally now rely on more than one mobile device during workdays? So give me a reason why you’re not making your mobile catalog. It isn’t hard to imagine our future sales team would use their mobile tablets for work. Besides, your customers would definitely want a mobile version of your catalog as well. Many people are on mobile today. Owning a mobile catalog for your brand is a great privilege to get closer to your customers. Hesitating because you’re on a tight budget? Needing help for the technology? AppGreen is here to provide support for building your unique catalog. Got update for your catalog? With mobile catalog, you don’t need to print a whole new version of it when it’s got updated. What you need to do is to update your product information in AppGreen’s web-based portal. The mobile catalog at all other devices of your sales agent or customers would be instantly up-to-date. With AppGreen’s future function, you could manage your sales activities at real-time among your team and collect the data through the all-in-one web-based portal. You reap what you sow. Your catalog grows as your business gets bigger. But do you know how many trees you would save by switching to mobile catalog? I know it’s not something big, but every effort counts! Isn’t it cool to have a mobile catalog?